This week has flown by but I'm getting a lot done and feeling like I have the housework under control again. The weather is changing and every day I see new shoots forming on roses and sage and the seeds I sowed a few days ago have all germinated. We had a short heavy storm which topped up the tanks in about 30 minutes flat, so even if it doesn't rain much in the coming weeks, we have ample water in the tanks for the gardens. I started a jumper for Alex recently but realised this week that the hanks of cotton I thought I had were a different colour and I can't get any more of the colour I started with. So while I'm deciding what to do with that project, I've started another one. This time it's a little pink and green cotton dress for my two year old granddaughter. Hopefully I'll finish that in time for her birthday in April. Hi Rhonda just looking at the bread in your picture today jog my memory to ask you a question. 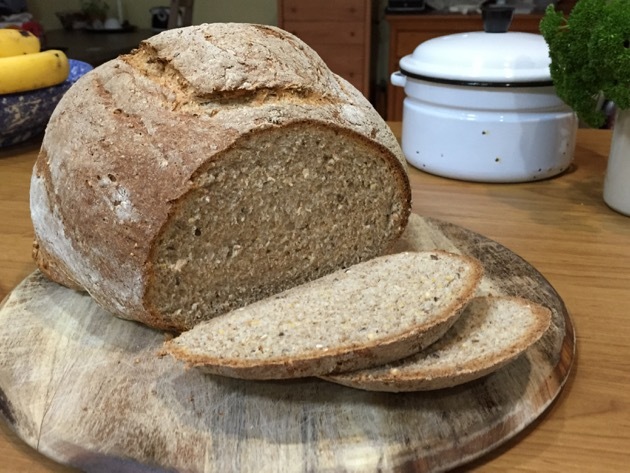 I have been making my own bread lately using your recipe and have been having great success but was wondering how you get on in the cooler months to get the bread to do its final rise. I don't have a hot water cupboard to put it in. Kate, our daytime winter temperatures are usually around 20 degrees so as long as I cover the dough, it rises. Try warming your oven for five minutes on low, then turn it off. That will give you enough warmth for the dough to rise. Good luck. In the colder months I make a little micro-climate in my microwave oven. I put a jug of almost boiling water in the microwave and then put the dough in there to rise. The temperature in the microwave oven is just enough to get the rise going no matter how cold the kitchen is. Sometimes I've sat it in the car in winter if it's cold but sunny. The sun is just enough to warm the inside of the car without being too hot. Hi Rhonda, is there any way of searching for a recipe that has been featured on your blog? I am referring to recipes that aren't included on your list of recipes under the heading "Rhonda's Recipes". Maria, try typing this into Google: down to earth blog lamb stew - the blog name and the name of the recipe you want. That's how I search for things. That quilt seems easy enough and so cool and funky! Reading the article your shared today, The Sad Cost of Renting makes me what to do something for those people who feel they will never own home. What will become of people when they reach retirement yet have to pay rent? What happens when there are more people then places available to rent? As the concern is for Sydney in the next few years. I am feeling very blessed that I have my own home and my children are paying off their own homes. Just recently discovered your blog Rhonda, a wonderful read. That is a beautiful bread. My husband is the one who makes the bread around here. He loves the dark, dense and full of fiber bread. He makes one just a bit "lighter" for me. I will show him this photo of your bread. Do you have a link to the recipe? Wishing a wonderful weekend for us all! That's a shame about the yarn, could you use both colours in stripes? Thank you for all the links. This statement gave me reason to pause: 'a little pink and green cotton dress for my two year old granddaughter'! Wow! Can't believe how quickly the young ones are growing!